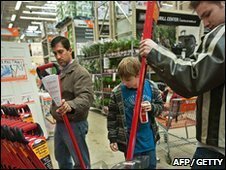 US retail sales rose more than expected in January, providing a boost to hopes for a strong economic recovery. Sales grew 0.5% month-on-month, while December's figure was revised to a 0.1% fall from a first estimate of a 0.3% fall, the Commerce Department said. Compared with January last year, sales were up by 4.7%. But separately, a closely-watched survey suggests that confidence among US consumers remains fragile as concerns about unemployment remain. Retail sales are followed particularly closely in the US, as consumer spending accounts for about 70% of overall US economic activity. "It's a nice surprise for the economy. It suggests that the consumer is willing to spend a little. It tells us that retail sales are in a clear recovery," said Kathleen Stephansen at Aladdin Capital Holdings. However, the latest Reuters/University of Michigan consumer sentiment survey suggests that such optimism might not be shared by many Americans. The February index fell to 73.7 from 74.4 in January. Some analysts said that low confidence could mean depressed spending for many months to come. "We expect that lingering high unemployment, weak income growth, low confidence, tight credit conditions and the continuing need to deleverage will constrain consumption growth for at least this year and possibly well beyond," said Paul Ashworth at Capital Economics. Despite the encouraging sales figures, US stocks fell after China clamped down further on bank lending. The main Dow Jones index slid 45 points to 10,099, while the S&P 500 also slipped 3 points to 1,075.51. The US economy grew by an annualised rate of 5.7% between October and December. The first estimate suggests the economy is growing at its fastest pace for six years.